The Great Recession has brought a substantial increase in unemployment in the Eurozone, with the average unemployment rate growing from 7.5% in 2007 to 11% in 2015. The change has been very heterogeneous. In Northern Europe, unemployment did not grow substantially, and in some cases even fell. In Germany, for example, the unemployment rate actually declined from 8.5% to 4.6%. At the same time, in Greece, unemployment increased from 8% to 25%, in Spain from 8% to 22%, and in Italy from 6% to 12%. Why have unemployment dynamics been so different? One of the most often-cited explanation is the difference in labour market institutions that prevents wages from adjusting downward (e.g. Fougère et al. 2016). If wages cannot decline, negative aggregate demand shocks (such as the Great Recession) result in the loss of jobs. On the other hand, if wages can fall, labour markets reach a new equilibrium with unemployment rates returning to normal levels. Downward adjustment of wages in response to macroeconomic shocks is especially important in the Eurozone where labour markets cannot accommodate shocks through exchange rate depreciation or through internal labour mobility (migration among EU countries is more limited than, for example, labour mobility across US states). This explanation has become policymakers’ conventional wisdom. Not surprisingly, deregulation of labour markets is the key component of structural reform programmes in most countries hit by the recent crisis. However, even though this logic is intuitive, the convincing empirical evidence behind it is rather scarce. Indeed, cross-country studies of labour markets – e.g. Nickell (1997), Card et al. (1999), Botero et al. (2004), Bentolila et al. (2011, 2012), Elsby et al. (2016) – are by definition subject to comparability concerns. Besides labour market institutions, there are numerous other differences between Northern and Southern Europe that can potentially affect unemployment dynamics. Similar problems arise when comparing labour markets in different industries within the same country (e.g. Besley and Burgess 2004). In order to construct a convincing counterfactual for a regulated labour market, one would need to study a non-regulated labour market in the same sector within the same country. The most natural way to do this is to compare formal and informal labour markets – considering informal employment as a proxy for unregulated counterfactual to the regulated formal labour market. The problem with this approach is the scarcity of data on the informal jobs. In our paper, we use a unique dataset that does allow carrying out a comparison between formal and informal workers (Guriev et al. 2016). Every year since 2001, the Foundation for Initiatives and Studies on Multi-Ethnicity (ISMU) conducts a large survey of immigrants working in Italy. These data cover around 4,000 full-time workers, a fifth of whom work in the informal sector. The dataset is therefore sufficiently large to compare the evolution of wages in the formal and informal sectors controlling for household characteristics, occupation, skills and other individual characteristics (age, gender, year of arrival to Italy, and country of origin). 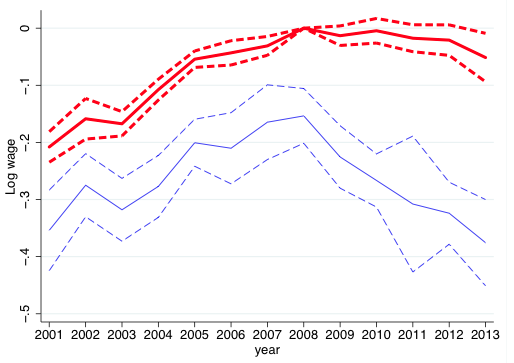 We adopt a difference-in-differences methodology in order to test our main hypothesis that a severe recession in Italy should have resulted in a larger decline of wages in the unregulated labour market (i.e. in the informal sector) compared to the regulated labour market (i.e. the formal sector). Our main result is presented in Figure 1, which shows the wage trends in the formal and informal labour markets controlling for occupation, gender, age, education, country of origin, and family characteristics. We find that the wage differential between formal/regulated and informal/unregulated sectors increased after 2008. Moreover, while wages in the informal sector decreased by about 20% in 2008-13, wages in the formal sector virtually did not fall. This is consistent with the view of a substantial downward stickiness of wages in the regulated labour market. Importantly, before the recession, wages in the formal and informal sectors moved in parallel (with a 15% premium in the formal sector) – confirming the validity of the parallel trends assumption essential for our difference-in-differences methodology, and showing that both regulated and unregulated labour markets have a similar degree of upward flexibility of wages. Note: Logarithm of after-tax wages (relative to formal sector in 2008) controlling for gender, age, education, country of origin, family characteristics, occupation dummies, province of residence dummies. Thick red line: formal labour market. Thin blue line: informal labour market. Dashed lines: 95% confidence interval. Source: ISMU survey, authors' calculations. We also look at the employment changes in the two sectors. We find that in 2008-2013, employment in the formal labour market fell by 16%. At the same time, employment in the informal labour market did not vary – if anything, it increased slightly (by 1.6%), although the change is not statistically significant. This finding is fully consistent with the conventional narrative – the downward rigidity of formal wages result in formal workers losing jobs or moving to the informal sector. What would have happened to wages and employment in the formal labour market if it were as flexible as the informal one? In order to answer this question, we calibrate a simple model with flows in and out of the labour force, and with flows between formal and informal labour markets. We assume that the aggregate demand shock affects both labour markets and use the existing estimates for demand and supply elasticities for the Italian labour market. We then carry out a counterfactual analysis of the formal sector's response to crisis in a scenario where formal wages were fully flexible. We find that in this case the crisis would have resulted in a much smaller decline in formal employment between 2008 and 2013 (1.5-4.5% rather than the 16% fall observed in the data). Therefore our results confirm the conventional logic of the importance of labour market flexibility. The destruction of formal jobs due to the wage rigidity puts an additional burden on the public finances (already stretched during recession) – due to lower employment taxes and higher unemployment benefits. Our work – which is based on immigration data –also contributes to the migration literature, by suggesting that labour market regulation can impact the effectiveness of immigration policies. For example, consider the policies that regulate immigrants’ legal status. Since undocumented immigrants can only work in the informal sector, labour market regulation may change the incentives for undocumented immigrants to apply for regularisation programmes and have important implications for immigrants’ labour market outcomes (Kossoudji and Cobb-Clark 2002), consumption behaviour (Dustmann et al. 2016) and propensity to commit crime (Pinotti 2016). Interestingly, we find that wage adjustment in the unregulated labour market is stronger in ‘simple’ rather than ‘complex’ occupations. The formers require only generic skills and allow for greater substitutability between workers (in particular, between natives and immigrants) within occupations and across occupations. In such jobs we should expect a greater downward adjustment in the absence of regulation. On the contrary, in ‘complex’ occupations workers need specific skills and are harder to replace, therefore even in unregulated labour markets wages may not decline during recession. We can speculate that even though our analysis is based on data on immigrants, its implications can be extended to the low-skilled natives employed in the ‘simple’ professions. And therefore the labour market reforms should prioritise these specific occupations. Bentolila, S, P Cahuc, J J Dolado, and T Le Barbanchon (2011), “Why have Spanish and French unemployment rates differed so much during the Great Recession?”, VoxEU.org, 22 January. Bentolila, S, P Cahuc, J J Dolado, and T Le Barbanchon (2012), “Two-tier labour markets in the Great Recession: France versus Spain”, The Economic Journal, 122 (562), F155-F187. Besley, T, and R Burgess (2004), “Can Labor Regulation Hinder Economic Performance? Evidence from India”, The Quarterly Journal of Economics 119(1), 91-134. Botero, J C, S Djankov, R La Porta, F Lopez-de-Silanes, and A Shleifer (2004), “The Regulation of Labor”, The Quarterly Journal of Economics 119(4), 1339-1382. Card, D, F Kramarz, and T Lemieux (1999), “Changes in the Relative Structure of Wages and Employment: A Comparison of the United States, Canada, and France”, Canadian Journal of Economics, 32(4), 843-877. Dustmann, C, F Fasani, and B Speciale (2016), “Illegal Migration and Consumption Behavior of Immigrant Households”, Journal of the European Economic Association, forthcoming. Elsby, M W L, D Shin, and G Solon (2016), “Wage adjustment in the Great Recession and other downturns: Evidence from the United States and Great Britain”, Journal of Labor Economics, 34 (S1), S249-S291. Fougère, D, E Gautier, and S Roux (2016), “The effect of minimum wage on wage bargaining at the industry level: Evidence from France”, VoxEU.org, 28 May. Guriev, S, B Speciale, and M Tuccio (2016), “How do regulated and unregulated labor markets respond to shocks? Evidence from immigrants during the Great Recession”, CEPR Discussion Paper 11403. Kossoudji, S A, and D A Cobb-Clark (2002), “Coming out of the Shadows: Learning about Legal Status and Wages from the Legalized Population”, Journal of Labor Economics, 20(3), 598-628. Nickell, S (1997), “Unemployment and Labor Market Rigidities: Europe versus North America”, Journal of Economic Perspectives, 11(3), 55-74.